" Innovation 2.0 in a Knowledge-based Society "
Technology innovation is an emergence out of the complex interaction of the actors and elements of innovation. It is also the outcome of the double helix structure of technology development and application innovation. The emergence and convergence of ICT enables knowledge-based society, dissolves the boundary of traditional organizations and acitivities. The boundary of traditional science labs also dissolves and further pushes the transition of technology innovation mode. The ordinary people and the users will have more say, and will be a main player in the innovation process. Innovation 2.0 which focus on application innovation, featuring user-centric, demand-driven, open innovation, co-innovation, is emerging in the knowledge-based society. 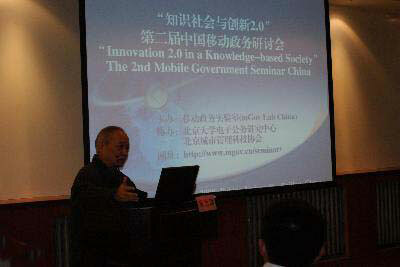 Focusing on the topic of innovation 2.0 in a knowledge-based society, the 2nd Mobile Government Senimar will be held in Peking University on 23 November 2008.